The bassinet was a helmet that came to use in the middle ages around the beginning of the 14th century. Originally, they had no visors, but eventually, the helmet evolved into this Pig Faced Bassinet, which was favored by warriors of all ranks. In fact, this style of bassinet was the successor to the traditional great helmet that was favored by knights in the centuries before. This style of bassinet was also referred to as a houndskull helmet (or a dog faced helmet). The term pig face helmet references the elongated snout on the helmets visor that features circular cut-outs to enhance the helmets ventilation and airflow, making it more comfortable to wear and easier to breathe in when the visor is closed. The top of the helmet is drawn back slightly, to help divert force away from the wearers skull when struck, while the bottom edge of the helmet features small circular cut-outs that are perfect for lacing this helmet onto an aventail or a coif to provide continuous protection to the head, shoulders, and neck. 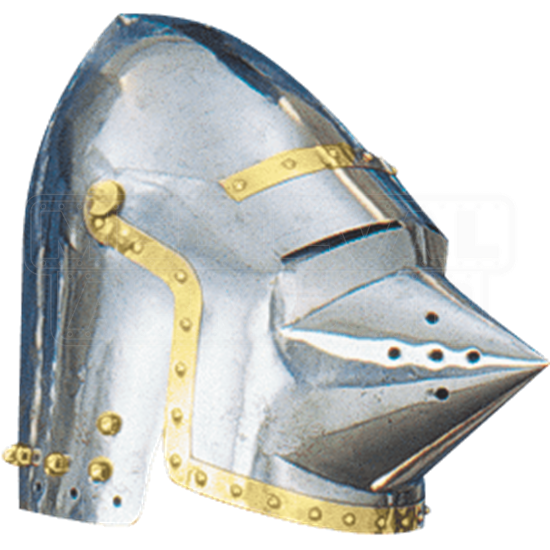 The helmet is crafted entirely from quality steel, making it a great piece of armor to wear any time you are headed into mock battle or LARP combat. 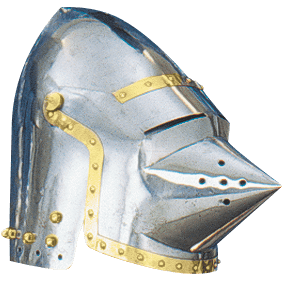 And thanks to its fantastic metallic look, this Pig Faced Bassinet Helmet is also a great helmet to include as a part of your collection, adding that touch of medieval style to any room you display it in.